Tourism Richmond&apos;s Cooperative Marketing Investment Program is supporting a brand-new Richmond experience. Initiated by local artisan chocolatiers Dominique and Cindy Duby of Wild Sweets, Meet the Makers - a Craft Tasting Experience gives visitors a chance to taste and experience the fantastic artisan products produced in southeast Richmond. Developed in partnership with Fuggles & Warlock and Canada Berries Winery, this new experience will be promoted through a social media campaign and brochure. Every Saturday afternoon, all three businesses will welcome visitors to come taste their products. Visitors will make their own way between each establishment, enabling them to explore and experience each destination at their own pace in any order they wish. 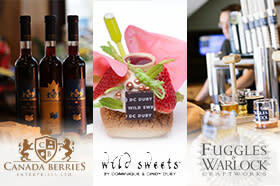 Along with tastings, visitors have the opportunity to take a behind-the-scenes tour and learn more about the creation process at Wild Sweets and Fuggles & Warlock Craftworks (check directly with each business for times and availability of tours). Find out more about Meet the Makers - a Craft Tasting Experience here. If you would like to stock the brochure, or find out more about Meet the Makers, please contact Ceri Chong, Industry Development Manager.